This interview took place in the artist's home in Pendlebury, Manchesterthe home of Fudge and a host of other charactersin the summer of 1979, eight years before his death in March 1987. His mother, Mrs Reid, was present. Ken Reid enjoyed a career as a children's illustrator for more	than forty years. The variety of comic book characters he created for FLEETWAY,	IPC and DC THOMSON have had as much effect on successive generations	as the Goons in the '50s, and Monty Python in the '60s. 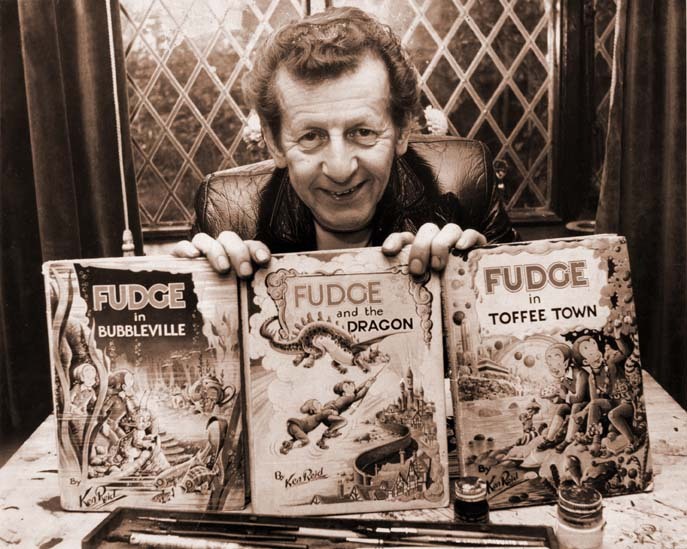 His most unique creation, the serialised strip adventures of Fudge the Elf was begun, "with artistic promise", in 1937, in the Manchester Evening News, but did not reach maturity until Ken Reid's return from the	Army in 1945. Unfortunately, the strip was not syndicated and its readership	remained largely in the North West of England. In Fudge, Ken Reid created that unique kind of fantasy dream world that	appeals both to adults and children, common to classics like Carroll's	Alice, Barrie's Peter Pan or Tolkien's Rings. In the comic strip format it is only matched in its consistent	excellence and strangeness by Winsor McCay's Little Nemo. David Britton: How did you first conceive the idea of Fudge? Ken Reid: I originally thought of a strip with a budgerigar called "Budge""The Adventures of Budge"but I just could not get the drawings right, so I thought I would introduce an elf with him, a form of semi-human character. I then had to think of a name for the elf that rhymed with "Budge". I went all through the alphabet until I came to "F""Fudge"which sounded right. It was also the name of a toffeefudge toffeeand, I found out later, it was also a newspaper term for a stop press item: "Stop the press there's a fudge coming through!" The drawings of Fudge were very different when I first began his adventures in 1938. He was smaller and rounder, not much bigger than the animals in the strip, and he grew up gradually over the years without me realising it. I started Fudge the Elf in late 1938 when I was seventeen, and he had not run for twelve	months in the Manchester Evening News, my local paper, when war broke out. DB: This seems an appropriate moment to ask you how you managed to	interest the News in the Fudge strip? Mrs Reid: When Ken was sixteen and seventeen years of age he used to go	round the Manchester art studios with his folio of drawings trying	to interest people sufficiently to obtain commissions. But work	was very hard to come by in those days and Ken was getting despondent. It was always the same tale that he received, "We will let you	know", but nothing ever came of it. It was Ken's father who suggested	that he try the News. But Ken was very dubious about doing this. The two of them did	eventually go to the News building, which was then in Cross Street. They were stopped at the entrance by the Commissionaire who asked if they had an appointment, to which Ken's father quickly replied that they had an appointment to see the Art Editorwho turned out to be a Mr Barton. Well, Mr Barton was very good. He looked through Ken's folio and was impressed. By a coincidence, he said, the News had been looking for an artist to do a children's strip. He told	Ken that if he would like to submit a sample drawing his work	would be considered, although he warned Ken that he could expect	some very stiff competition from other artists. The strip had	to have a story line, and up until that time Ken had only done	artwork. He sent them the example he had promised and thought	that that would be the end of it. There was nobody more surprised	than him when he got word that the job was his if he wanted it! KR: I remember before I started work on Fudge I took a small, rented room behind a shop in Water Street in	central Manchester. The rent was 7/6d a week, and I converted	the room into a studio. I used to travel to this one room every	day on my bicycle from lrlam-o'th-Height where I lived at that	time. It was a handy place to try and build up a business in. There was a photographer's on the floor above and when they needed	artwork with life in it they used to send it down for me to draw. When I started	Fudge I no longer needed the office; I could do the work more easily	from home. The whole building on Water Street was blown up during	the war. DB: Did you have a formal art education? KR: I was granted a free scholarship to Salford Art School when I	was thirteen. I suspect that if I had gone in for the full scholarship,	with all the different subjects, I would have failed hopelessly,	so I just did the art part and they passed me on that. Later,	after the war, I attended Manchester Art College in the evenings. DB: How did the character of Speck come about? The Fudge stories in the newspaper feature Speck very prominently. At times	it seems that he is the dominant character. KR: Speck was the adventurous one. Speck usually got them both in	a mess. Speck was not in the strip when it first started. The	strip had been running for about six weeks as a series, three-picture	stories each night. The News then asked me if I could convert it into a serial, to encourage readers to buy the paper on consecutive nights to find out what would happen next to Fudge. It was then that I introduced Speck, so that Fudge would have someone to talk tomost of the plots that went into the storyline have their basis in everyday things. I think that you have a photograph of me looking at a tank of tropical fish (in the frontis-photo of Savoy's edition of Fudge in Bubbleville), from which came the idea of an underwater adventure for Fudge. DB: Speck featured prominently in the first strip that you did after	the war. I always felt Speck's Inventions contained some of your finest artwork, and it was a great pity	you didn't do this one as a book as you did with Fudge in Bubbleville and the others. Any particular reason why not? KR: Speck's Inventions was probably the longest Fudge story that I did. It ran for almost	twelve months in the News, and it would have been impractical to reduce it down to the	same size as the annuals that London University Press did. All	the Fudge annuals had to be edited down from their original published length	in the newspapers. DB: In what order were the original Fudge books released? KR: The first book, The Adventures of Fudge, was done only as a book, written especially for the publisher,	and not as a reprint from the News. It differed from the other books because it was largely text,	with illustrations laid-out amongst the print. The second book,	Frolics with Fudge which was first published in the News, set the format for the rest of the books. Fudge's Trip to the Moon was the third, also first published by the News (as were all the later titles). I remember I had to redraw certain	illustrations for this book, for quite a few of the original frames	had been lost. I drew the replacements while still in the Army,	stationed at Bristol. I had to stop behind at night and work on	the book while the rest of the men went out after duties. This	is why some readers may detect a difference in style around the	middle of the book. DB: Which Fudge stories do you personally enjoy most? KR: Fudge and the Dragon I particularly like, and I enjoyed doing Fudge and the Old Well, which only appeared as a newspaper strip. DB: I recall you once told me that Fudge and the Flame Fairies contained some of your finest artwork, and that the original	artwork for the whole story disappeared under mysterious circumstances	that we shall not go into here. KR: Yes. The editor of the News, Thomas Henry, also liked that one the best. Anything that was capable of producing flame, or even an electric spark anything that produced fire in any formwent on strike. Absolutely everything went deadcar engines fizzled out because no spark could be generated in the spark plugs, candles could not be made to burn. That was how the story began, and Fudge was given the job of finding out what the unrest was aboutand to try to put matters right. As I remember it was a very long strip, and now the original artwork is lost. DB: Did you find that ideas came easier to you when you were working	on the Fudge strips? KR: It was easier then than it is now to come by ideas. Fudge was easier because once I got the general theme for the story,	the skeleton of the plot, then I just added to it as I went along. Also, I did not have such a strict deadline. I had plenty of time	to think. Later, in the 1950s, when I started doing strips for	D C Thomson, time became more important. I used to work through	the day until I pm, then come downstairs and watch television	until midnight. There was no ITV, just the one channel. Then I	would start again at twelve and work through until 3 am. DB: Who were your influences? Did Arthur Rackham, Heath Robinson,	and the book illustrators of the turn-of-the-century have any	influence? KR: I remember Heath Robinson. But one of my earlier influences was	Walt Disney, Snow White, etc. If you have noticed the cap that Fudge wears you will have	noticed the similarity to Mickey Mouse's face. Fudge also had	a Mickey Mouse figure in the very first drawings I did of him. DB: Did the films of Max Fleischer make any impression on you? Gulliver's Travels, the Betty Boop cartoons? Mike Moorcock drew parallels between Fleischer's work	and some of the characters in Fudge and the Dragon. KR: No, I don't think so, although I do remember them. I feel that	Disney was the main influence. DB: How did you get involved with the children's comics? Odhams / Fleetway / IPC magazinesJasper the Grasper (Wham); The Nerves (Smash and Pow); The Sub (Scorcher); Football Forum (Scorcher); Banger and Masher (Scorcher); Manager Matt (Scorcher); Hugh Fowler (Scorcher); The Soccernauts (Scorcher and Score); Harry Hammertoe (? ); Jimmy Jinks (Scorcher); Triptoe Triers (? ); Dare-a-Day Davy (Wham); Wanted (competition in Whoopee); Creepy Creations (competition in Whoopee); World Wide Weirdies (competition in Whoopee); Prize Picture (competition in Whoopee); Martha's Monster Make-up (Whoopee); Super Sam (Comic Cuts Amalgamated Press); Foxy (Comic Cuts Amalgamated Press); Roger the Dodger (Beano); Grandpa (Beano); Bing-Bang Benny (Dandy); Angel Face (Dandy); Jonah (Beano); Big Head and Thick Head (Dandy); Ali Ha-Ha and the Forty Thieves (Dandy); Jinx (Beano); and others. KR: At one stage, in the late fifties, it certainly was. Fudge the Elf took three days. Two days on Jonah, and other work for both The Dandy and The Beano (Big Head & Thick Head; Ali Ha-Ha, and the 40 Thieves) and amongst other work I was doing a competition page for the	Irish edition of The Sunday Express. DB: Could you tell me why the Fudge strip was discontinued in the news? *Roger the Dodger made his debut in The Beano No. 561, April 18th, 1953; Grandpa, 1955; Little Angel Face,1954; Bing-Bang-Benny, 1956; Ali Ha-Ha and the 40 Thieves, 1960; Big Head and Thick Head, 1963. See also: Of Elves And Ethics (All About Ken Reid's Fudge) by Carolyn Horn. In the Pictures section: the banned episode of Dare-A-Day Davy from Wham!, unseen since 1969 and exclusive to this site.